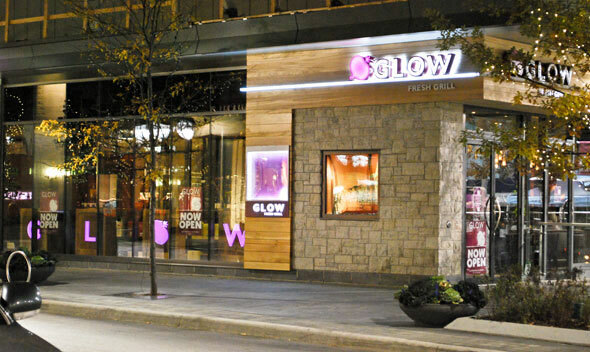 Glow Fresh Grill & Wine Bar, in the Shops at Don Mills , got off to a rather unfortunate start. Back in August, only a few weeks after opening a patio heater got a little too friendly with a designer chair, igniting a fire which led to extensive damages . Bummer. Good thing owner Rose Reisman and her Pickle Barrel partner aren't quitters. After a temporary closure to clean up all the mess Glow is back in business with the same locally sourced, health-focused menu as before. We arrive hungry and seconds after opening the menu I'm immediately attracted to the in-house burger. But what's this? Attraction quickly turns to disillusion when I realize the burger comes without a bun. Apparently the no-carbs Atkins diet fad is alive and well in this small pocket of North Toronto. To console myself I order instead what's called the burger slider appetizer. But these three mini burgers (photo at top) are also served sans bun. One is ground turkey topped with dried fig chutney. Another is beef with caramelized onions and fingerling potato, and the third is a pungent ground lamb served with a mint infused hummus and feta topping. Bun or not, this cultural tour of pairings and flavors surprises and is a definite recommend. 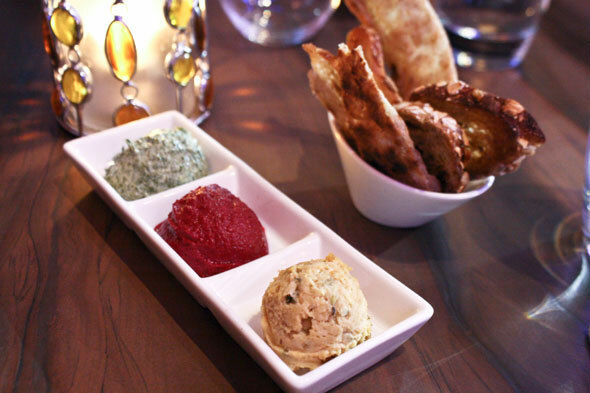 Next up, our waiter brings us an amuse bouche of fresh bread and three dips - an under seasoned hummus, something with a ricotta flavor, and a refreshing melange of spinach and yogurt. For our mains we stick with the carbs. 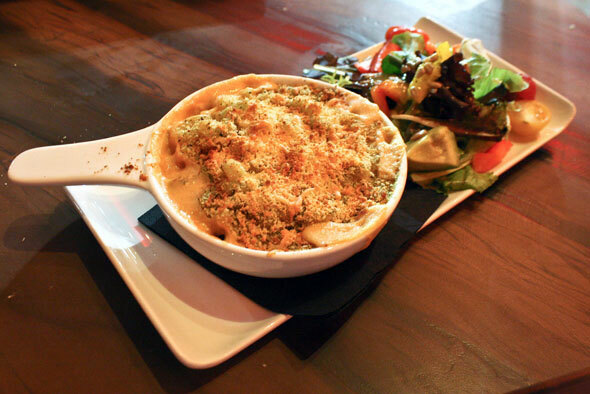 The mac and cheese is a refreshing aternative to the often too rich and creamy upscale versions of this dish. 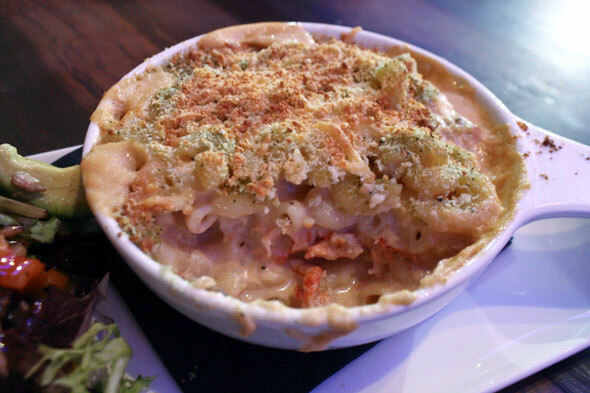 The macaroni, cooked perfectly al-dente, is paired with gruyere, cheddar and tiny pieces of lobster under a skin of earthy herb encrusted bread crumbs. This was no Kraft Dinner my friends. It was damn satisfying and perfect comfort food for a cool Fall night. Because Glow is on a health kick, the kitchen pairs the mac and cheese with a small side salad that comes with berries, various greens, avocado, sunflower seeds and a maple vinaigrette. 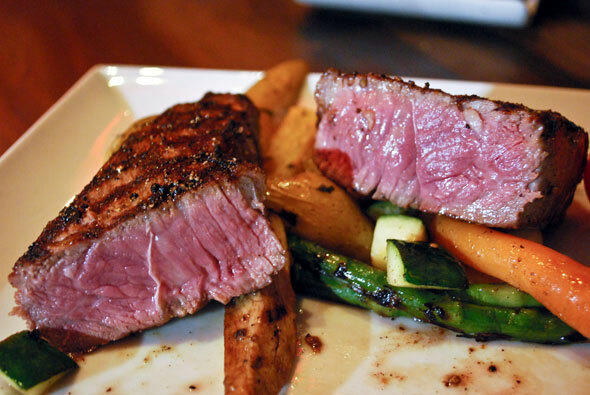 Across the table, my diner in crime chowed down on the strip loin ($26), well seasoned and cooked to a perfect medium rare. Served with grilled oyster mushrooms, fingerling potatoes, asparagus spears it too was a hit and well worth the price tag. 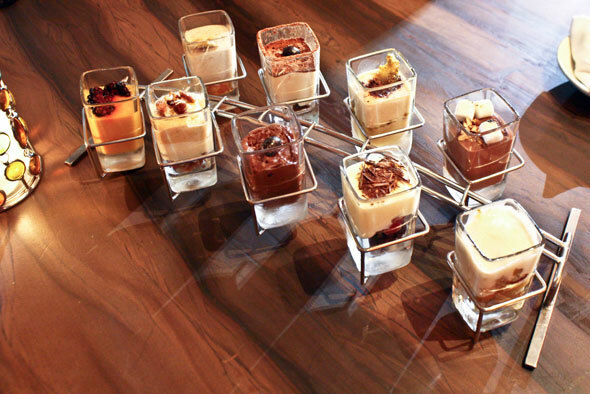 For dessert, we can't decide between a plate of four Canadian cheeses ($18) or an assortment of dessert shooters ($3 each). After a bit of a debate we go for the shooters and order up two of the nine options available - the carrot cake and the tiramisu. How did they taste? Exactly how you'd expect, albeit with less sugar. We were a bit disappointed though. I guess we expected something a bit more innovative. So what did we think of Glow? 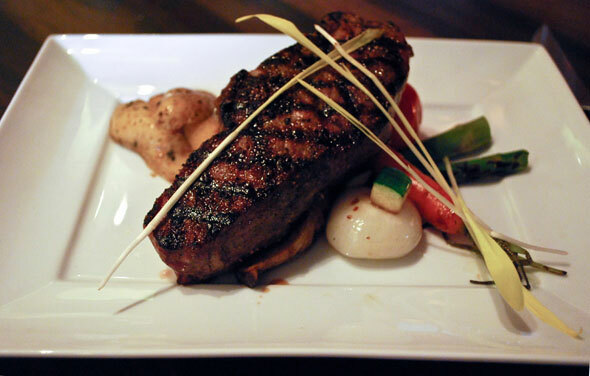 Overall, we weren't a fan of the relatively small portions and moderate to high prices. 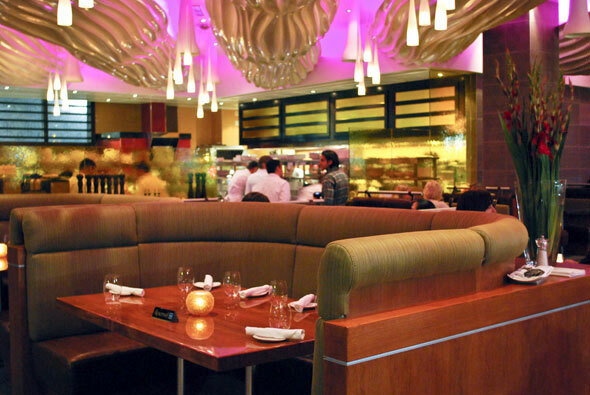 But the menu is well thought out and definitely offers something different for those tired of too many carbs, butter and other fattening fare.